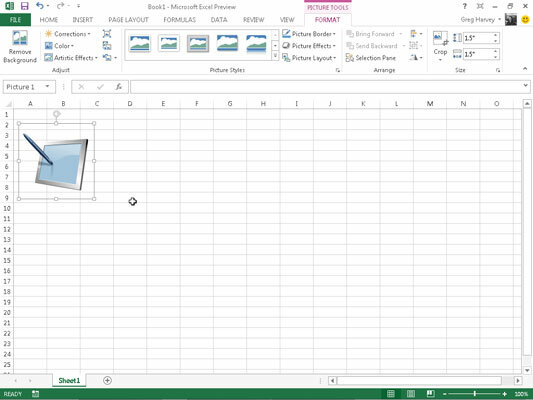 Excel 2013 gives the option of editing and formatting inserted pictures. When you first insert an image into the worksheet, it’s selected automatically, indicated by the sizing handles around its perimeter and its rotation handle at the top. To deselect the clip art image and set it in the worksheet, click anywhere in the worksheet outside of the image. Move the clip art image or imported picture to a new location in the chart by dragging it. Resize the clip art image or imported picture by dragging the appropriate sizing handle. Rotate the clip art image or imported picture by dragging its rotation handle (the green circle at the top) in a clockwise or counterclockwise direction. Delete the clip art image or imported picture by pressing the Delete key. When an inserted picture is selected in the worksheet, Excel adds the Pictures Tools contextual tab to the Ribbon with its sole Format tab. The Format tab is divided into four groups: Adjust, Picture Styles, Arrange, and Size. Remove Background opens the Background Removal tab and makes a best guess about what parts of the picture to remove. You have the option to mark areas of the picture to keep or remove, and the shaded areas update as you isolate what areas of the picture you want to keep. Click Keep Changes when you are finished or Discard All Changes to revert back to the original picture. Corrections to open a drop-down menu with a palette of presets you can choose for sharpening or softening the image and/or increasing or decreasing its brightness. Or select the Picture Corrections Options item to open the Format Picture dialog box with the Picture Corrections tab selected. There you can sharpen or soften the image or modify its brightness or contrast by selecting a new preset thumbnail on the appropriate Presets palette or by entering a new positive percentage (to increase) or negative percentage (to decrease) where 0% is normal in the appropriate combo box or dragging its slider. Color to open a drop-down menu with a palette of Color Saturation, Color Tone, or Recolor presets you can apply to the image, set a transparent color (usually the background color you want to remove from the image), or select the Picture Color Options item to open the Picture Color tab of the Format Picture dialog box. There you can adjust the image’s colors using Color Saturation, Color Tone, or Recolor presets or by setting a new saturation level or color tone temperature by entering a new percentage in the appropriate combo box or selecting it with a slider.